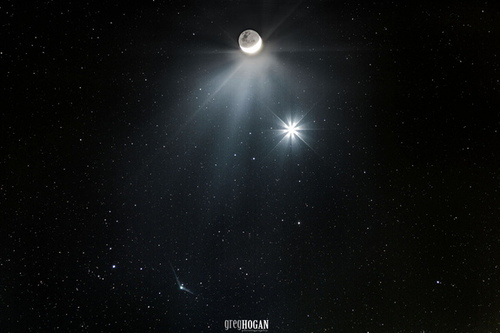 Astrophotographer Greg Hogan caught Comet Catalina (bottom), Venus (center), and the moon (top). on Dec. 7, 2015, from Kathleen, Georgia. He writes in an email to Space.com: "I was able to get what I think is a great shot of this morning's conjunction of Catalina, Venus and the moon. I did one short exposure to expose for the moon. I then merged the two images to over lap to get the lunar details. I used a Canon 7D on a EQ Mount for tracking. I stacked the image in DEEP SKY STACKER and balanced the exposures using Lightroom 4." They are just papers...not peer reviewed at all, and i was afraid they would pull this stunt and the media would make a big deal about guess work. Most sites involved with this are not impressed. Look of a high bluff.....is it a raft at 2 miles, a schooner at 10 miles or a tanker at 15 miles. There are reportedly more than a million objects floating around the belt. They both were data mining ALMA results, an extremely narrow search swath. The body can't be too large or gravitational effects would have been noticed. The body can't be too far out, or the light source would not be our sun. Probability is another rocky body in the belt. Most experts expect it to be another rocky body, one of millions. I agree. An 18+ JM (Jupiter Mass) object up to 28,000 AU out would have been detected by WISE, and a Saturn-sized object as far out as 10,000 AU. Super-Earth would be 300-500AU detectable (depending on atmosphere and size), and so on. It's a simple calculation based upon the rate of movement over a given period of time to determine how far out the object is. It cannot go any slower or faster than that if it's in Solar Orbit. We're quite familiar with Orbital Mechanics here on Earth. Speed = distance when you're in orbit around anything. There are no exceptions, except for objects heading inbound or outbound. 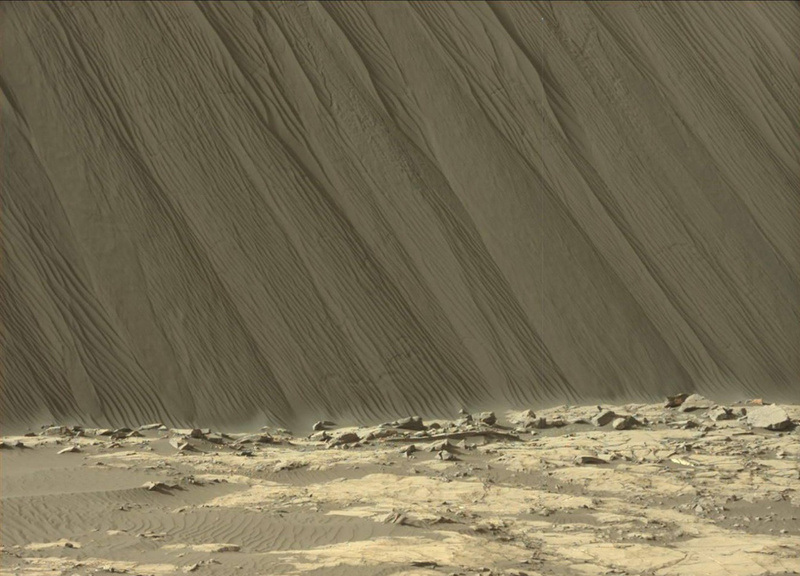 The rippled surface of the first Martian sand dune ever studied up close fills this view of "High Dune" from the Mast Camera (Mastcam) on NASA's Curiosity rover. This site is part of the "Bagnold Dunes" field along the northwestern flank of Mount Sharp. The dunes are active, migrating up to about one yard or meter per year. The component images of this mosaic view were taken on Nov. 27, 2015, during the 1,176th Martian day, or sol, of Curiosity's work on Mars. The scene is presented with a color adjustment that approximates white balancing, to resemble how the sand would appear under daytime lighting conditions on Earth. The annotated version includes superimposed scale bars of 30 centimeters (1 foot) in the foreground and 100 centimeters (3.3 feet) in the middle distance. More information about Curiosity is online at http://www.nasa.gov/msl andhttp://mars.jpl.nasa.gov/msl/. Wow, that is friggin sand from another planet. This view of the undisturbed surface of a Martian sand dune called 'High Dune' visited by NASA's Curiosity rover shows coarse grains remaining on the surface after wind removal of smaller particles. This view shows grains of sand where NASA's Curiosity Mars rover was driven into a shallow sand sheet near a large dune. The disturbance by the wheel exposed interior material of the sand body, including finer sand grains than on the undisturbed surface. Sunlight is coming from the left. The scene covers an area 1.3 inches by 1.0 inch (3.3 by 2.5 centimeters). This is a focus-merge product from Curiosity's Mars Hand Lens Imager (MAHLI), combining multiple images taken at different focus settings to yield sharper focus at varying distances from the lens. The component images were taken on Dec. 3, 2015, during the 1,182nd Martian day, or sol, of Curiosity's work on Mars. Those dunes are amazing....it is on another world...../s Waiting for the giant sand worms to show on Arrakis /s. One could imagine how neat it would be to travel on an alien world such as this, and listen to the wind shifting the sand, and watching the hues in the atmosphere....I would never leave after seeing that. Just a note about the great colors in these shots. Last decade or so, had the images with the reddish hues and they have been corrected now. I remember always having to go to various sites, where photo professionals would apply the adjustments according to the color palette plate attached to the rover. Some archive shots show the plate for reference. These shots look great.....Thank's for posting them jjkusaf. Agreed, DD. Those shots are incredible. Not that stupid washed-in-red nonsense. Whoever decided all Mars images needed to be red-saturated should be shot in the rear with paintballs, repeatedly. Those dunes are incredible! Looking at all that fine detail, I kept thinking "wow .... wow .... WOW ... WOW! ... WOW!!!!!" Excellent science returns this year from all the world's Space Agencies. It's one for the record books. Best year since .. well, ever. Voyagers, Veneras and Vikings came close, though -- but this year was the best as far as science returns go. NASA's Cassini spacecraft has been in Saturn orbit for over a decade and it has seen the whole spectrum of ringed planet delights. 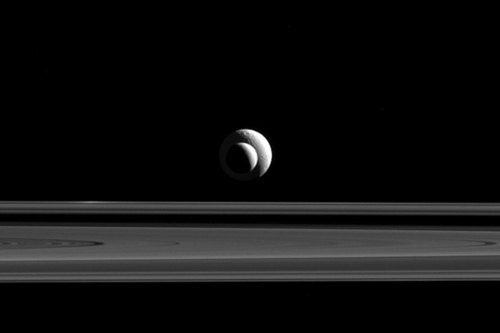 But there are few views in Saturnian orbit that are more satisfying than seeing two or more moons in the same frame — particularly when they align. In this stunning example of celestial good timing on Sept. 24, Cassini snapped Enceladus drift in front of larger moon Tethys in near-perfect alignment. Interestingly, the size difference between the two moons closely reflect their relative differences in diameter. Enceladus is 313 miles (504 kilometers) across whereas Tethys is 660 miles (1,062 kilometers) across. At the time of the moon transit, Cassini was 1.3 million miles (2.1 million kilometers) from Enceladus and 1.6 million miles (2.6 million kilometers) from Tethys, meaning the 2 moons were only approximately 300,000 miles (500,000 kilometers) apart. 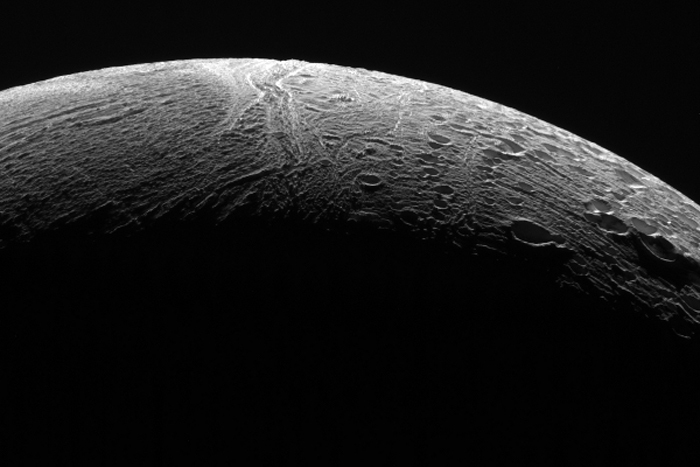 Enceladus is of huge scientific interest to NASA and the Cassini mission. Now known to contain a sub-surface ocean beneath an icy crust, the small moon is thought to possess the ingredients for life. Cassini is currently lining up for its last ever flyby of Enceladus on Dec. 19, an encounter known as E-22 (the 22nd flyby), coming within 3,106 miles (4,999 kilometers) of the moon's surface. This image was taken by Mastcam: Left (MAST_LEFT) onboard NASA's Mars rover Curiosity on Sol 1194 (2015-12-16 01:59:11 UTC). The image is simply stunning," said Noah Petro, Deputy Project Scientist for LRO at NASA's Goddard Space Flight Center in Greenbelt, Maryland. "The image of the Earth evokes the famous 'Blue Marble' image taken by Astronaut Harrison Schmitt during Apollo 17, 43 years ago, which also showed Africa prominently in the picture." 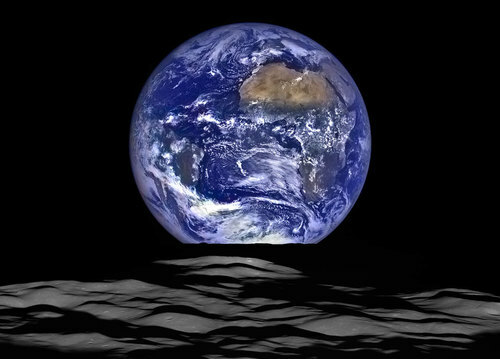 In this composite image we see Earth appear to rise over the lunar horizon from the viewpoint of the spacecraft, with the center of the Earth just off the coast of Liberia (at 4.04 degrees North, 12.44 degrees West). The large tan area in the upper right is the Sahara Desert, and just beyond is Saudi Arabia. The Atlantic and Pacific coasts of South America are visible to the left. On the moon, we get a glimpse of the crater Compton, which is located just beyond the eastern limb of the moon, on the lunar farside. LRO was launched on June 18, 2009, and has collected a treasure trove of data with its seven powerful instruments, making an invaluable contribution to our knowledge about the moon. 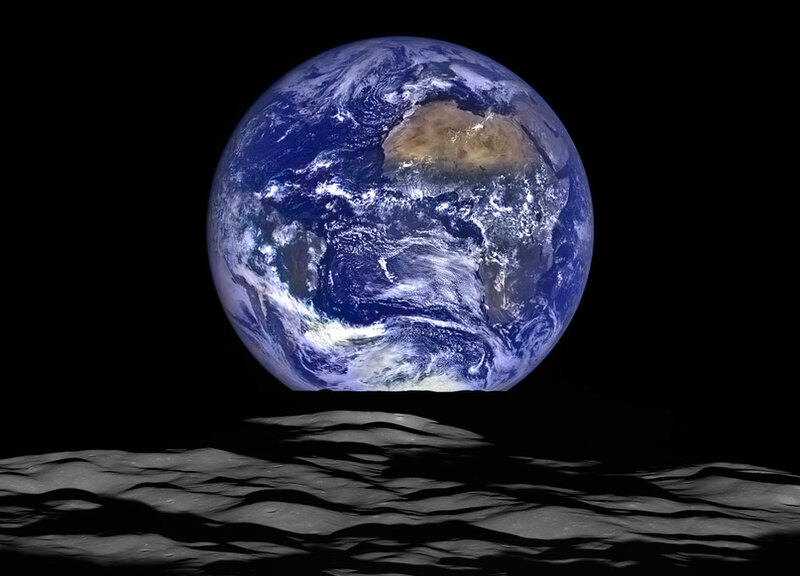 LRO experiences 12 earthrises every day; however the spacecraft is almost always busy imaging the lunar surface so only rarely does an opportunity arise such that its camera instrument can capture a view of Earth. Occasionally LRO points off into space to acquire observations of the extremely thin lunar atmosphere and perform instrument calibration measurements. During these movements sometimes Earth (and other planets) pass through the camera's field of view and dramatic images such as the one shown here are acquired. This image was composed from a series of images taken Oct. 12, when LRO was about 83 miles (134 kilometers) above the moon's farside crater Compton. Capturing an image of the Earth and moon with LRO's Lunar Reconnaissance Orbiter Camera (LROC) instrument is a complicated task. First the spacecraft must be rolled to the side (in this case 67 degrees), then the spacecraft slews with the direction of travel to maximize the width of the lunar horizon in LROC's Narrow Angle Camera image. All this takes place while LRO is traveling faster than 3,580 miles per hour (over 1,600 meters per second) relative to the lunar surface below the spacecraft! An exciting chapter of space exploration history will come to a close as NASA's Cassini spacecraft makes its final close flyby of Saturn's active, ocean-bearing moon Enceladus. Image courtesy NASA/JPL-CalTech. A thrilling chapter in the exploration of the solar system will soon conclude, as NASA's Saturn-orbiting Cassini spacecraft makes its final close flyby of the ocean-bearing moon Enceladus. Cassini is scheduled to fly past Enceladus at a distance of 3,106 miles (4,999 kilometers) on Saturday, Dec. 19, at 9:49 a.m. PST (12:49 p.m. EST). Although the spacecraft will continue to observe Enceladus during the remainder of its mission (through September 2017), it will be from much greater distances - at closest, more than four times farther away than the Dec. 19 encounter. The upcoming flyby will focus on measuring how much heat is coming through the ice from the moon's interior - an important consideration for understanding what is driving the plume of gas and icy particles that sprays continuously from an ocean below the surface. The HiRISE camera aboard NASA's Mars Science Laboratory imaged these dust devils active on a plain in Ganges Chasma (Valles Marineris) in July. Inset: Zoomed-in portion of the 2 dust devils that are believed to be interacting and rotating in opposite directions. By now most of us know that Mars is a windy planet (well, not as windy as “The Martian” would have us believe), where active aeolian processes shape the landscape continuously. Active dune fields are evidence of the large-scale transport of fine Mars sand whereas dust devils (like miniature tornadoes) show us the small scale and short-lived atmospheric processes that can sculpt dark tracks into the surface. Fortunately for humanity, we have an armada of satellites in orbit around the Red Planet and these atmospheric phenomena can be recorded and tracked. Take, for example, this stunning observation by the High-Resolution Imaging Science Experiment (HiRISE) camera on board NASA’s Mars Reconnaissance Orbiter (MRO). 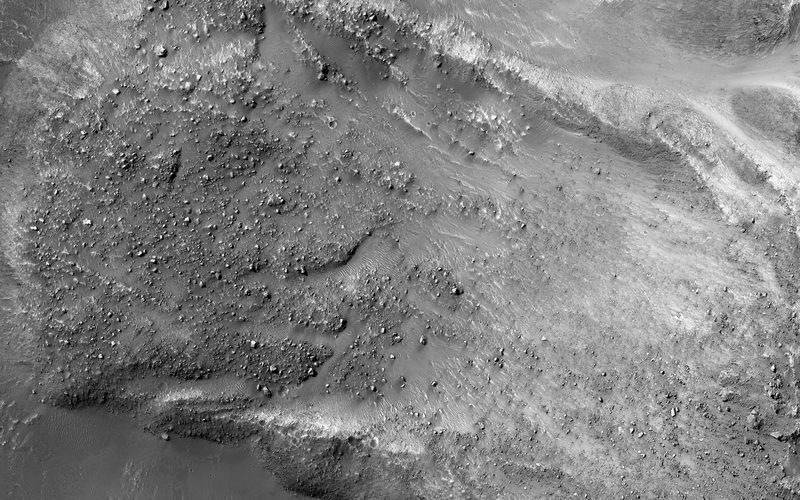 In this view over a plain in Ganges Chasma (inside the famous Valles Marineris region), HiRISE was able to spy on not one dust devil, but a whole swarm of them. The observation was made in July 2015 (and released last month) and it is hoped that some of the secrets behind dust devil formation and evolution may be revealed. These are the 8 dust devils as observed by the HiRISE camera -- 5 of which were imaged through color filters. Also in the observation are a row of four dust devils spaced approximately 900 meters (half a mile) apart in a row. In the full observation across the region, more dust devils can be seen whirling to the south. 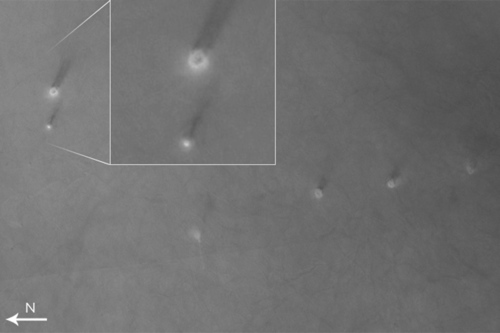 Dust devils form on Mars in the same way they do on Earth. Heating of the surface creates a thin warm layer of air. If the conditions are right, this air starts to rise and rotate, creating a lower pressure region. Eventually, angular momentum builds and a funnel of rotating air can reach high into the atmosphere. As noted by Geissler, dust devils are thought to migrate uphill or, if there’s a breeze, downwind — sounds pretty logical. But when dust devils are found in pairs, they are thought to spin in opposite directions. 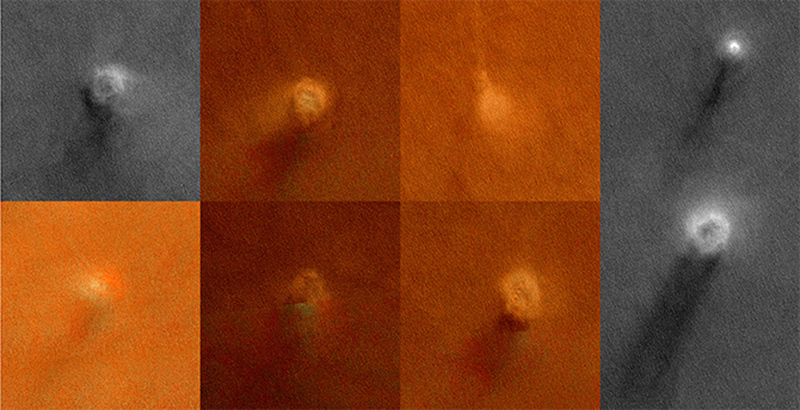 The best thing is that HiRISE images the Martian surface through different color filters and each snapshot in either infrared, red and blue occur at different times, instrument scientists can decipher which direction the dust devils are rotating. This analysis will be forthcoming. But for now, the fact that we’re seeing active atmospheric processes on Mars is a wonder. On Earth, we take dust devils for granted, but on Mars, they play a key role in the characteristics and dust content of the atmosphere — a field of study of great interest to scientists. And HiRISE is playing a key role in our understanding of these whirlwinds on Mars. NASA's Magnetospheric Multiscale is delivering promising early results on a process called magnetic reconnection - a kind of magnetic explosion that's related to everything from the northern lights to solar flares. The unprecedented set of MMS measurements will open up our understanding of the space environment surrounding Earth, allowing us to better understand what drives magnetic reconnection events. These giant magnetic bursts can send particles hurtling at near the speed of light and create oscillations in Earth's magnetic fields, affecting technology in space and interfering with radio communications. Scientists from the Southwest Research Institute, NASA, the University of Colorado Boulder and the Johns Hopkins University Applied Physics Laboratory presented an overview of MMS science and early results on Dec. 17, 2015, at the American Geophysical Union's Fall Meeting in San Francisco. Planned for more than 10 years, the MMS mission started with the launch of four identical spacecraft on a single rocket in March 2015. Nine months later, the spacecraft are flying through the boundaries of Earth's magnetic system, the magnetosphere. Their initial orbit is taking them through the dayside boundaries of the magnetosphere -- known as the magnetopause -- where the solar wind and other solar events drive magnetic reconnection. Eventually, their orbit will loop out farther to carry them through the farthest reaches of the magnetosphere on the night side, where magnetic reconnection is thought to be driven by the build-up of stored energy. 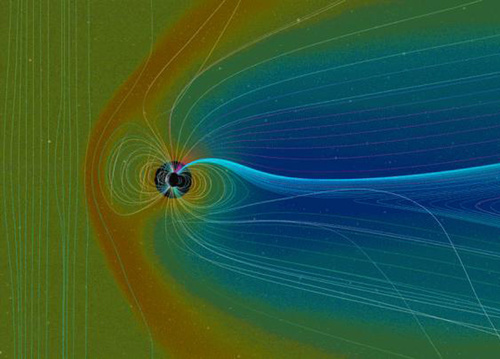 "We've recorded over 2,000 magnetopause crossings since our science phase began," said Jim Burch, principal investigator for the MMS mission at Southwest Research Institute in San Antonio, Texas. "In that time, we've flown through hundreds of promising events." MMS' four instrument suites and incredible measurement rates -- a hundred times faster than ever before on certain instruments -- is giving scientists their best look ever at magnetic reconnection. In fact, the mission's high resolution produces so much data it requires a scientist on duty during every MMS contact to prioritize which data is sent down from the spacecraft. One of the key features of MMS is its scaling ability. The four spacecraft fly in a four-sided, pyramid-shaped formation called a tetrahedron, allowing them to build up three-dimensional views of the regions and events they fly through. Because the four spacecraft are controlled independently, the scale of their formation -- and their observations -- can be zoomed in or out by a factor of ten. Though many people think of space as a completely empty vacuum, it's actually filled with electrically charged particles and electric and magnetic fields, which form a state of matter called plasma. All of this magnetic and electric energy means that magnetic reconnection plays a huge role in shaping the environment wherever plasma exists -- whether that's on the sun, in interplanetary space, or at the boundaries of Earth's magnetic system. Japan -- Auroras are dimly present throughout the night in polar regions, but sometimes these lights explode in brightness. Now Japanese scientists have unlocked the mystery behind this spectacle, known as auroral breakup. 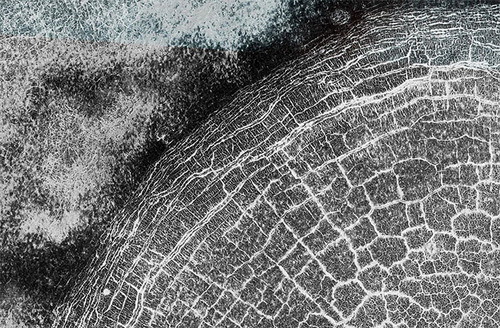 he new images showcase details of the cratered and fractured surface. 3-D versions of two of these views are also available. Among the striking views is a chain of craters called Gerber Catena, located just west of the large crater Urvara. Troughs are common on larger planetary bodies, caused by contraction, impact stresses and the loading of the crust by large mountains -- Olympus Mons on Mars is one example. The fracturing found all across Ceres' surface indicates that similar processes may have occurred there, despite its smaller size (the average diameter of Ceres is 584 miles, or 940 kilometers). Many of the troughs and grooves on Ceres were likely formed as a result of impacts, but some appear to be tectonic, reflecting internal stresses that broke the crust. "Why they are so prominent is not yet understood, but they are probably related to the complex crustal structure of Ceres," said Paul Schenk, a Dawn science team member at the Lunar and Planetary Institute, Houston. The images were taken as part of a test of Dawn's backup framing camera. The primary framing camera, which is essentially identical, began its imaging campaign at this lowest orbit on Dec. 16. Both cameras are healthy. Dawn's other instruments also began their intense period of observations this month. The visible and infrared mapping spectrometer will help identify minerals by looking at how various wavelengths of light are reflected by the surface of Ceres. The gamma ray and neutron detector is also active. By measuring the energies and numbers of gamma rays and neutrons, two components of nuclear radiation, it will help scientists determine the abundances of some elements on Ceres. Earlier in December, Dawn science team members revealed that the bright material found in such notable craters as Occator is consistent with salt -- and proposed that a type of magnesium sulfate called hexahydrite may be present. 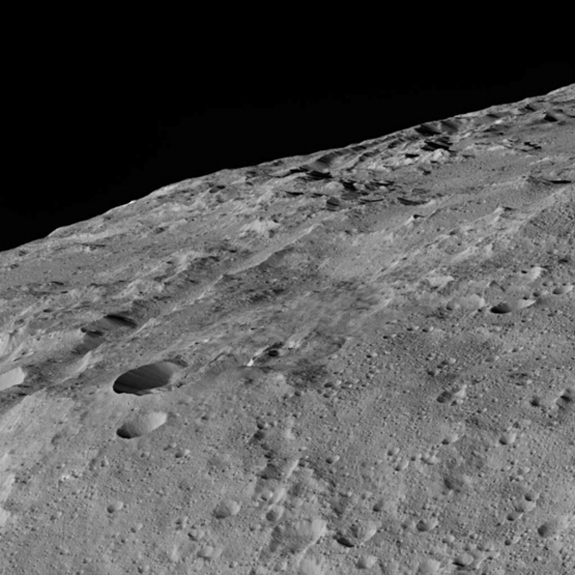 A different group of Dawn scientists found that Ceres also contains ammoniated clays. Because ammonia is abundant in the outer solar system, this finding suggests that Ceres could have formed in the vicinity of Neptune and migrated inward, or formed in place with material that migrated in from the outer solar system. 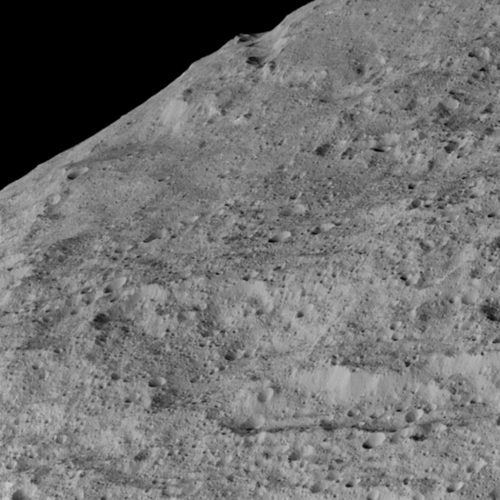 "As we take the highest-resolution data ever from Ceres, we will continue to examine our hypotheses and uncover even more surprises about this mysterious world," said Chris Russell, principal investigator of the Dawn mission, based at the University of California, Los Angeles. Dawn is the first mission to visit a dwarf planet, and the first mission outside the Earth-moon system to orbit two distinct solar system targets. It orbited protoplanet Vesta for 14 months in 2011 and 2012, and arrived at Ceres on March 6, 2015. NASA's Cassini spacecraft has begun transmitting data and images from the mission's final close flyby of Saturn's active moon Enceladus. Cassini passed Enceladus at a distance of 3,106 miles (4,999 kilometers) on Saturday, Dec. 19, at 9:49 a.m. PST (12:49 p.m. EST). "This final Enceladus flyby elicits feelings of both sadness and triumph," said Earl Maize, Cassini project manager at JPL. "While we're sad to have the close flybys behind us, we've placed the capstone on an incredible decade of investigating one of the most intriguing bodies in the solar system." Cassini will continue to monitor activity on Enceladus from a distance, through the end of its mission in Sept. 2017. Future encounters will be much farther away -- at closest, more than four times farther than this latest encounter. This was the 22nd Enceladus encounter of Cassini's mission. The spacecraft's discovery of geologic activity there, not long after arriving at Saturn, prompted changes to the mission's flight plan to maximize the number and quality of flybys of the icy moon. 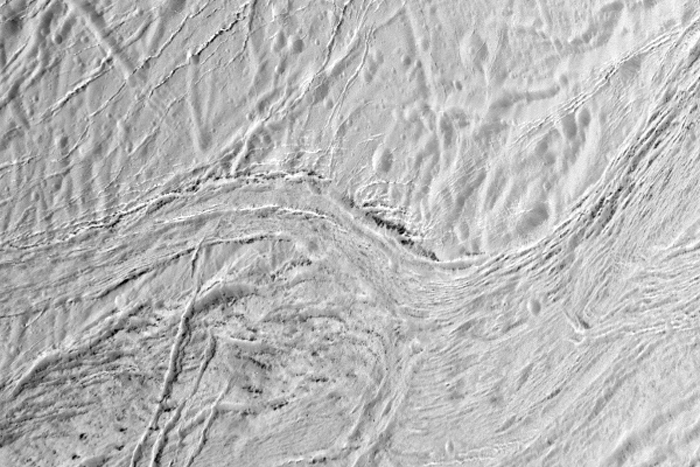 After revealing Enceladus' surprising geologic activity in 2005, Cassini made a series of discoveries about the material gushing from warm fractures near its south pole. Scientists announced strong evidence for a regional subsurface sea in 2014, revising their understanding in 2015 to confirm that the moon hosts a global ocean beneath its icy crust. The Cassini-Huygens mission is a cooperative project of NASA, ESA (European Space Agency) and the Italian Space Agency. NASA's Jet Propulsion Laboratory in Pasadena, California, manages the mission for the agency's Science Mission Directorate in Washington. The Cassini imaging operations center is based at the Space Science Institute in Boulder, Colorado. The images for panorama obtained by the rover's 34-millimeter Mast Camera. The mosaic, which stretches about 30,000 pixels width, includes 199 images taken on Sol 1197 (December 19, 2015). In today’s 2-sol plan, we’ll continue driving around "Namib Dune". On the first sol we’ll use ChemCam to assess the composition and grain size of a ripple. Then we’ll use Mastcam to image the brink of the dune and its slipface to characterize the dune morphology. We’ll also use Mastcam to document an outcrop with an unusual purple hue. Afterwards, Curiosity will drive even closer to the dune slipface, and we’ll take post-drive imaging to prepare for targeting over the weekend. On the second sol, we’ll acquire a 360-degree Mastcam mosaic for geologic context. We’ll also use ChemCam to monitor the composition of the atmosphere, and Mastcam to assess atmospheric opacity. Throughout the plan Curiosity will acquire a lot of REMS observations to monitor the wind as we move through this dune field. As the GSTL today, it was a real challenge to get all of these observations into the plan while staying within our data volume constraints. It’s hard to curb your imaging appetite when the views are so spectacular! 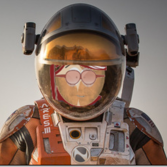 Lauren is a Research Geologist at the USGS Astrogeology Science Center and a member of MSL science team. This has to be the best view of Mars that I have ever seen...and I get to pan in and out as well as rotate 360 degrees....this requires some play time. 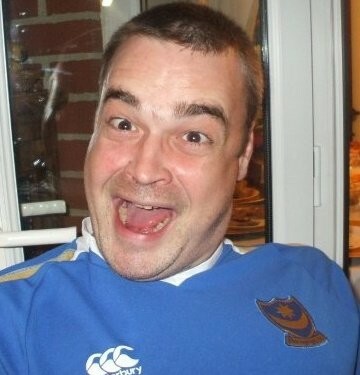 Thanks for uploading this jjkusaf, much appreciated. 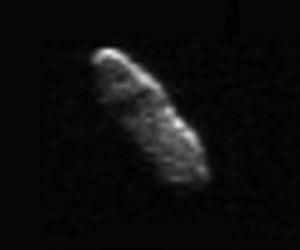 New images, shared Wednesday by NASA, showcase the size and shape of the Christmas Eve asteroid -- the highest resolution images to date. As UPI previously reported, asteroid 2003 SD220 will pass by Earth on the day before Christmas at a distance of 6.8 million miles, or 28 times the distance between the moon and the Earth. The new radar images of the asteroid were collected over the last week by Deep Space Network's 230-foot (70-meter) antenna at Goldstone, California. "The radar images data suggest that asteroid 2003 SD220 is highly elongated and at least 3,600 feet in length," Lance Benner, a scientist at the Jet Propulsion Laboratory and head of NASA's asteroid radar research program, said in a press release. "The data acquired during this pass of the asteroid will help us plan for radar imaging during its upcoming closer approach in 2018." The forthcoming flyby is just one of five asteroid 2003 SD220 encounters Earth will experience over the next 12 years. The asteroid will be back in three years at an even closer distance of 1.8 million miles. Though NASA is aware of dozens of Near Earth Objects, there are no known objects on a direct collision path with planet Earth. Still, astronomers are interested in studying the ways asteroid orbits can be influenced by the gravity of other objects. Mosaic of the surface: Most of the 130 bright spots (shown in red here) on the dwarf planet Ceres are associated with craters, as this image shows. Three zooms provide a closer look at these regions. Top left: A kind of haze appears above the Occator crater when the Sun shines in. Therefore, this could indicate that the crater contains frozen water beneath the surface. Top right: The Oxo crater is the second brightest structure on Ceres. A kind of haze can be found there as well. Bottom: A typical crater without water. The brightness originates from mineral salts which could have dried up over time. 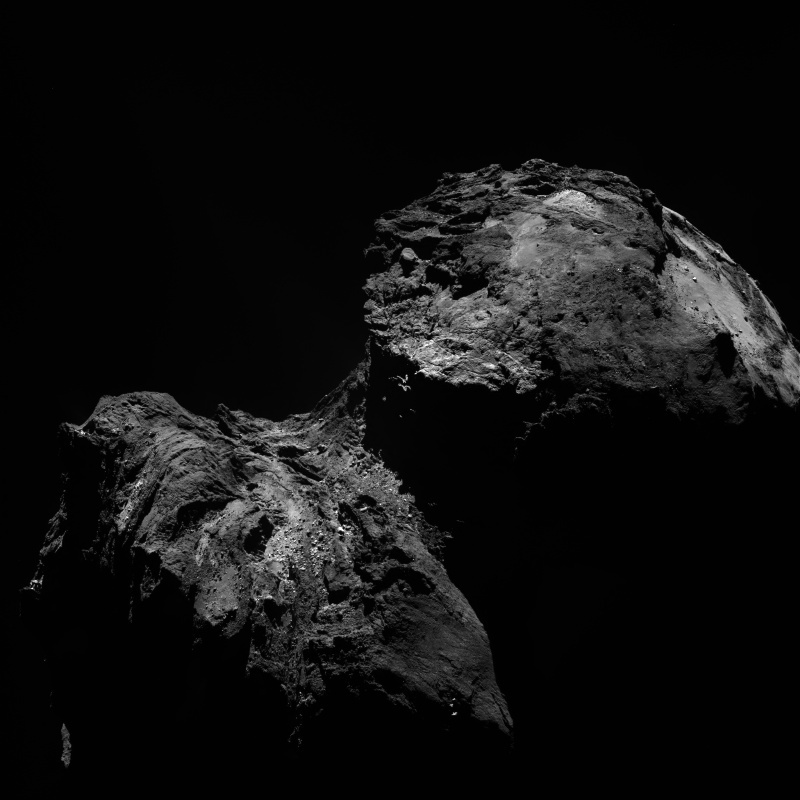 Image courtesy NASA/JPL-Caltech/UCLA/MPS/DLR/IDA. When the Sun shines into the Occator crater on the surface of the dwarf planet Ceres, a kind of thin haze appears above its brightest spot. This can be seen in images taken by the camera system aboard NASA's Dawn space probe, which researchers under the lead of the Max Planck Institute for Solar System Research published on 9 December, 2015 in Nature magazine. The haze indicates that frozen water may exist near the surface . The bright spots in the Occator crater likely contain magnesium sulphates, a class of mineral salts. Many of the other bright areas on Ceres' surface most likely by now consist solely of dried mineral salts. The new results show that since the birth of the Solar System frozen water has been able to survive not only in its furthest reaches, but also in the comparatively close asteroid belt. An invisible border runs between the rocky planets of the inner Solar System and the gaseous giants further out. Around 4.5 billion years ago, water and other volatile substances evaporated from the regions close to the Sun leaving behind the inner planets Mercury, Venus, Earth and Mars as dry, rocky worlds. Only very far from the Sun these substances could survive. Image courtesy NASA/JPL/University of Arizona. larger image at......well apparently......here now! The striking feature in this image, acquired by the High Resolution Imaging Science Experiment (HiRISE) camera on NASA's Mars Reconnaissance Orbiter on March 19, 2014, is a boulder-covered landslide along a canyon wall. Landslides occur when steep slopes fail, sending a mass of soil and rock to flow downhill, leaving behind a scarp at the top of the slope. The mass of material comes to rest when it reaches shallower slopes, forming a lobe of material that ends in a well-defined edge called a toe. This landslide is relatively fresh, as many individual boulders still stand out above the main deposit. Additionally, while several small impact craters are visible in the landslide lobe, they are smaller in size and fewer in number than those on the surrounding valley floor. 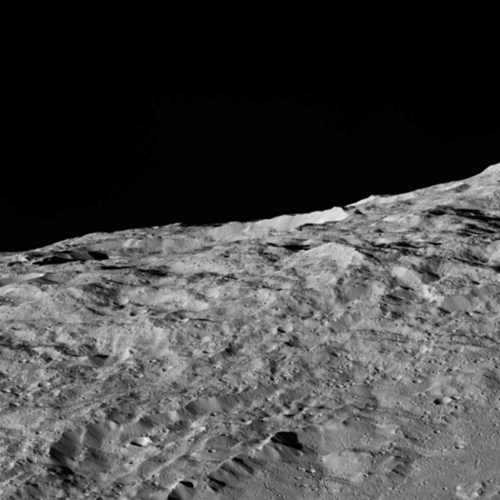 The scarp itself also looks fresh compared to the rest of the cliff: it, too, has boulders, and more varied topography than the adjacent dusty terrain. Just to the north of the landslide scarp is a similarly-shaped scar on the cliffside. However, there is no landslide material on the valley floor below it. The older landslide deposit has either been removed or buried, a further indicator of the relative youth of the bouldery landslide. 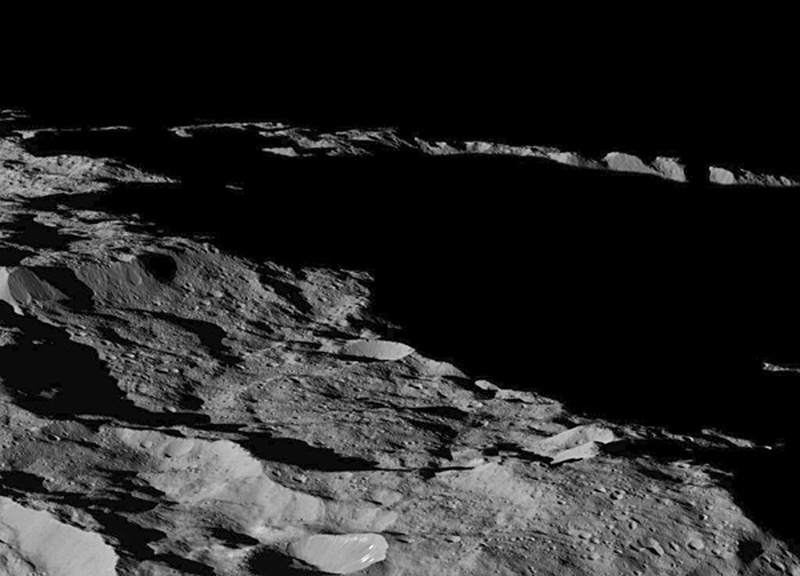 NASA's Dawn probe took a series of stunning new images of Ceres' chain of craters called Gerber Catana, from an altitude of just 240 miles (385 kilometers) – the closest the spacecraft has ever come to the dwarf planet. Among the major science findings from the close-up view is the discovery that Ceres, despite its diminutive size (only about 590 miles wide, or 950 km), displays internal stresses similar to what you would find on a larger body, such as Mars. Grooves and troughs on the surface of Ceres were mostly created after meteorite impacts, but some are shaped in a way that suggests tectonic forces. This view of Ceres, taken by NASA's Dawn spacecraft on December 10, shows an area in the southern mid-latitudes of the dwarf planet. It is located in an area around a crater chain called Samhain Catena, from an approximate distance of 240 miles (385 kilometers) from Ceres. "Why [the groves and troughs] are so prominent is not yet understood, but they are probably related to the complex crustal structure of Ceres," said Paul Schenk, a Dawn science team member at the Lunar and Planetary Institute in Houston, in a statement. Dawn's backup framing camera snapped the images to test out its capabilities. The primary camera is also working perfectly and began taking pictures at this altitude Dec. 16. Meanwhile, Dawn is looking for signatures of minerals and various elements on Ceres using an onboard instrument called the visible and infrared mapping spectrometer (which detects light reflected off the surface) in concert with the gamma-ray and neutron detector (which looks for components of nuclear radiation), the statement said. A close-up view of the dwarf planet Ceres, taken on Dec. 10, 2015, by the Dawn space probe, during a maneuver that placed the probe within 240 miles (385 kilometers) of Ceres. The $466 million probe left Earth in 2007, made a stop at another large body in the asteroid belt, Vesta, and arrived at Ceres last March. A few weeks ago, the Dawn spacecraft may have finally solved a particularly perplexing mystery of Ceres: Observations by the probe showed that mysterious bright spots on the dwarf planet's surface are likely salt deposits. 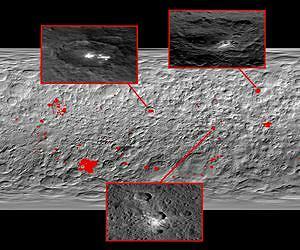 "As we take the highest-resolution data ever from Ceres, we will continue to examine our hypotheses and uncover even more surprises about this mysterious world," said Chris Russell, principal investigator of the Dawn mission who is based at the University of California, Los Angeles. 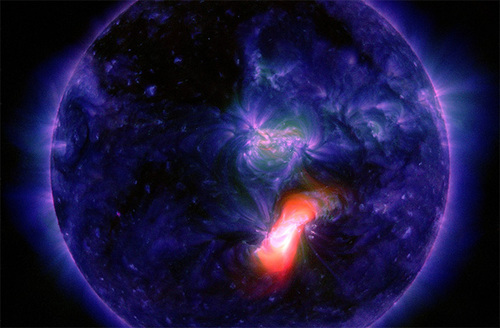 Sun Blasts Flare at Earth: New Year's Eve Storm? This NASA Solar Dynamics Observatory observation shows a composite view of our sun in extreme-ultraviolet light. On Dec. 28, the sunspot cluster AR2473 erupted with a M1.9 flare, sending a coronal mass ejection at Earth. You can say what you like about our nearest star, but as this latest solar eruption proves, it certainly has impeccable timing. On Monday (Dec. 28), a sunspot cluster erupted, blasting an M-class flare directly at Earth. The extreme-ultraviolet radiation immediately washed over our upper atmosphere, initiating an ionization event that caused a radio blackout over South America, Africa and the south Atlantic Ocean. The blackout may have been detected by mariners and ham radio operators in the 20MHz frequency range, according to SpaceWeather.com. Although the flare certainly wasn’t of the strength of a major X-class flare (the most powerful class of flare), this event did trigger a significant coronal mass ejection (CME) that is currently racing in the direction of Earth. Space weather forecasters predict a direct hit with Earth’s magnetic field on or around New Year’s Eve, potentially sparking some natural fireworks in the upper atmosphere just in time for 2016. As the magnetic field lines become forced together above these sunspots, magnetic reconnection may occur, accelerating solar plasma to relativistic speeds, generating intense bursts of radiation. These are solar flares and their radiation reaches Earth in minutes. However, CME’s are bubbles of magnetized high-energy plasma that are ejected into space at high speed, but nowhere near relativistic speeds. CMEs can reach Earth in several hours or a few days, depending on the ferocity of the eruption. And today’s flare and CME happened to be generated by the same sunspot that was Earth-directed, maximizing our chances of having a geomagnetic storm right in time for New Year’s. So if you live in high latitudes, and pay attention to the sky, you may be in for a New Year treat as high-energy solar particles impact our atmospheric gases, generating bright aurora. UPDATE: The NOAA Space Weather Prediction Center updated the WSA-ENLIL Solar Wind Prediction model to show an impact to our geomagnetic field by December 30th. Although coronagraph imagery shows that the majority of plasma is directed to the south and west, they still forecast that a shock passage will still take place within 48-72 hours. A moderate (G2) geomagnetic storm watch was added. More updates in the days ahead. The northern territory of Saturn's icy moon Enceladus is seen in glorious detail by NASA's Cassini spacecraft during its final close flyby of the moon on Dec. 19, 2015. 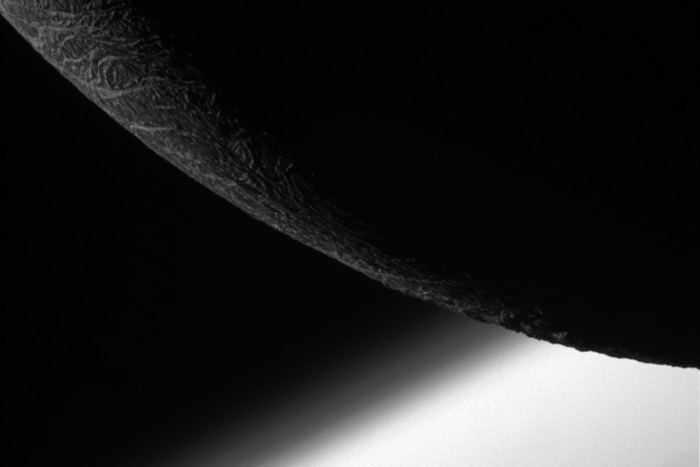 Saturn's geyser-spurting moon Enceladus received its last close-up from NASA's Cassini mission, and the results are stunning. Cassini made its final close flyby of the moon on Dec. 19, when it passed within 3,106 miles (4,999 kilometers) of the surface. "This final Enceladus flyby elicits feelings of both sadness and triumph," Cassini project manager Earl Maize at NASA's Jet Propulsion Laboratory (JPL) in California said in a statement. "While we're sad to have the close flybys behind us, we've placed the capstone on an incredible decade of investigating one of the most intriguing bodies in the solar system." 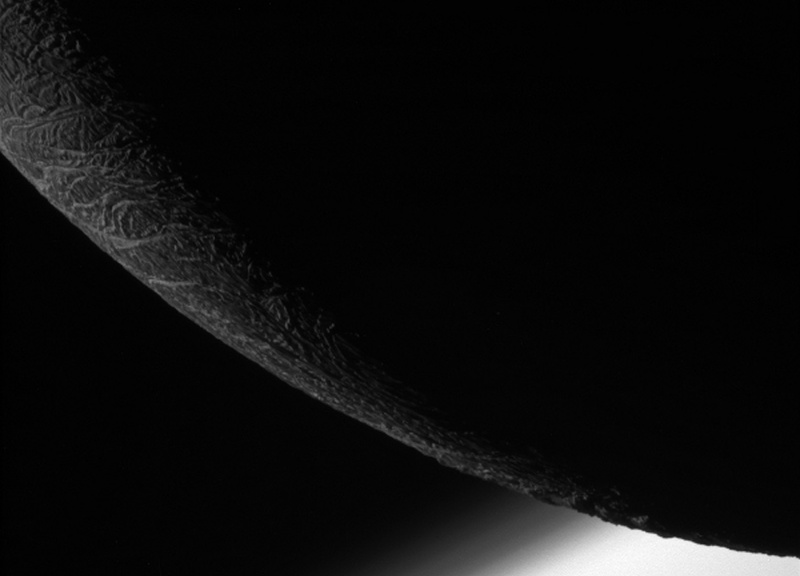 NASA's Cassini spacecraft captured this view of craggy features on the limb of Saturn's moon Enceladus during the spacecraft's final close flyby on Dec. 19, 2015. After Cassini arrived at Saturn in 2004, it didn't take long for the spacecraft to reveal that Enceladus boasted surprising geologic activity. Cassini revealed that, far from being a stagnant chunk of ice and rock, the moon contained a series of geysers across its southern pole. The discovery caused changes to the original mission flight plan to maximize flybys of the moon. 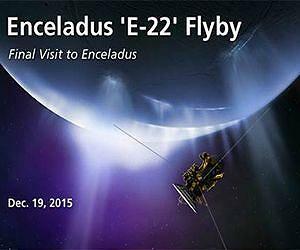 The final flyby was Cassini's 22nd Enceladus encounter. In addition to studying the characteristics of the geysers, Cassini also revealed that the icy moon contains a global ocean layer and geologic activity beneath its icy crust. These discoveries make Enceladus one of the best potential sites in the solar system where life had the potential to evolve beyond Earth. Hopefully, Cassini won't be the last of the moon's visitors; NASA is considering a mission to Enceladus in the next decade. Cassini will wrap up its mission in 2017 by plunging into Saturn's atmosphere. Until then, it will continue to study Enceladus from farther away, though its closest passes will be no closer than four times farther than its final encounter. On Saturn's ice-covered moon Enceladus, nearly parallel ridges and furrows mark a region known as Samarkand Sulci in this image as seen by NASA's Cassini spacecraft during its final close flyby of the moon on Dec. 19, 2015. "We bid a poignant goodbye to our close views of this amazing icy world," said Linda Spilker, Cassini's project scientist, who is also at JPL. The "wisps" are relatively young fractures on the trailing hemisphere of Dione's (698 miles or 1123 kilometers across) icy surface. 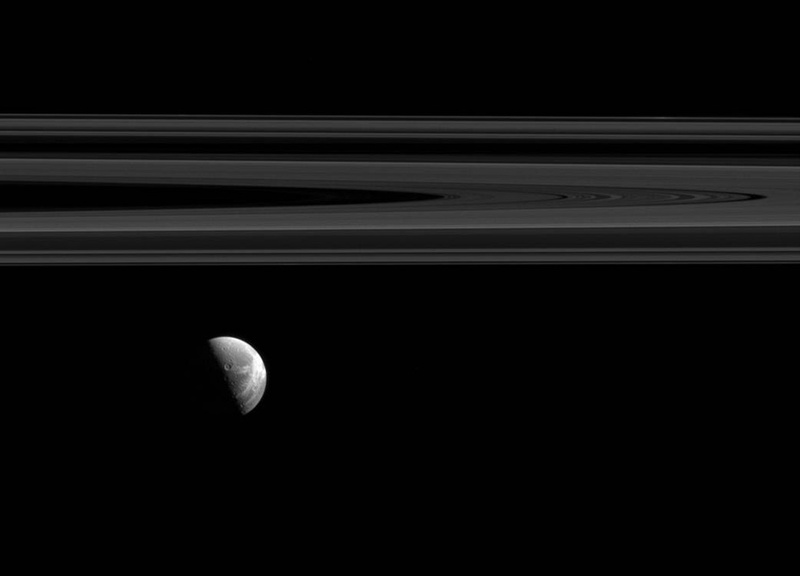 This view looks toward the anti-Saturn side of Dione. North on Dione is up. The image was taken in visible light with the Cassini spacecraft narrow-angle camera on Aug. 15, 2015. The view was obtained at a distance of approximately 1.1 million miles (1.7 million kilometers) from Dione. Image scale is 7 miles (11 kilometers) per pixel. Calling the effort a "comeback to the moon," European space planners envision a series of human missions to the lunar vicinity starting in the early 2020s. Those missions, according to the plan, will include coordination between astronauts and robotic systems on the lunar surface. Robots would land first, paving the way for human explorers to set foot on the moon later. SEOUL, Dec. 30 (Yonhap) -- South Korea's science ministry said Wednesday it plans to launch a lunar exploration project next year, eventually seeking to send a landing vessel by 2020. Under the first stage of the project that will run from 2016 to 2018, the Ministry of Science, ICT and Future Planning will allocate 197.8 billion won (US$169 million) to conduct research and send an orbiter. The ministry said it has already secured a 20 billion-won budget for 2016. South Korea plans to develop the orbiter and the ground station independently with its own technologies, the ministry added. It will also seek cooperation with overseas researchers, such as the U.S. National Aeronautics and Space Administration (NASA), to develop payloads. For the second phase of the project, the ministry will send a landing vessel to the moon with its own developed launch vehicle. The ministry added it will make efforts to utilize its prior experiences in developing satellites. MOSCOW (Sputnik) – Russia has not dropped its lunar program and rumors of it being stricken from the federal program are “greatly exaggerated,” Russian Deputy Prime Minister Dmitry Rogozin said Wednesday. On Tuesday, media reports suggested, citing the updated version of the Federal Space Program (FSP), that in 2016-2025 Russia would suspend creation of a lunar lending complex, a lunar orbital station, a lunar space suit, and the system of robotic software for moon flights. Earlier in the year, the Russia Space Agency Energia said that the first Russian unmanned lunar mission would be performed by 2025, and the first manned flight in 2029-2030. “We are not dropping the lunar program. Rumors of its death are greatly exaggerated,” Rogozin said during an interview with Russia’s Rossiya-24 television channel. The media reports claimed that the decision to drop or postpone the lunar program was taken in light of the huge expenses needed for the program’s launch. The Russian Izvestia newspaper calculated that Russia would save some 88.5 billion rubles ($1.2 billion at the current exchange rate), if it suspended the lunar program. Russian deputy prime minister also stated that Russia has begun creating an ultra-heavy carrier rocket for deliveries of deep space exploration. “Work has begun in the new space program. I’ll tell you this as some sort of serious news that this is an ultra-heavy rocket,” Dmitry Rogozin said. The carrier rocket will be used as a “truck” to deliver expeditions into deep space, according to him. On Tuesday, Russia's space agency Roscosmos approved the updated Federal Space Program for years 2016-2025. The agency also stated in its final annual report that it had fulfilled all the plans scheduled for 2015, which would help engage in new undertakings. The geomagnetic storming watch for 30 December has been upgraded to a G3 (Strong), with a G1 (Minor) storming watch still in effect for 31 December. These watches are in response to consistent WSA-Enlil modeling results and SWPC forecasters' determination that a coronal mass ejection (CME) impact is likely just after mid-UTC day on 30 December with residual CME effects continuing into 31 December. 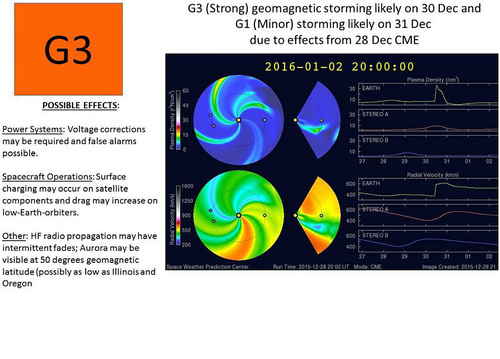 The CME impact may cause a sudden impulse geomagnetic response at Earth, likely resulting in the G3 conditions. The CME was associated with a long-duration M1 flare (R1-Minor radio blackout) that peaked at 1245 UTC (0745 ET) on 28 December. Keep checking the SWPC website for continued updates. The work NASA does, and will continue in 2016, helps the United States maintain its world leadership in space exploration and scientific discovery. The agency will continue investing in its journey to Mars, returning human spaceflight launches from American soil, fostering groundbreaking technology development, breakthroughs in aeronautics and bringing to every American the awe-inspiring discoveries and images captured by NASA's missions in our solar system and beyond. This image of Mars full disc captured from a distance of 55,000 km by India's Mars Orbiter Spacecraft. The North Pole is clearly seen in this shot. This High Dynamic Range (HDR) image was generated out of multiple shots of same view bringing dark to bright feature details in a better way. This HiRISE observation shows the northwest quadrant of a fracture-filled crater on Mars. A lacy web of bright frost-filled fractures fills a crater near the north pole of Mars in this image, acquired Sept. 20, 2015 with the HiRISE camera aboard NASA’s Mars Reconnaissance Orbiter (MRO). The entire crater is around 3 miles (5 km) across and its ancient interior has undergone countless millennia of freeze/thaw cycles that have broken the surface into polygonal shapes. This process is common on Mars and can even be found on Earth, but this particular image depicts it exceptionally nicely. The crater rim constrains the polygon formation within the crater close to the rim, creating a spoke and ring pattern of cracks. This leads to more rectangular polygons than those near the center of the crater. The polygons close to the center of the crater display a more typical pattern. A closer look shows some of these central polygons, which have smaller polygons within them, and smaller polygons within those smaller polygons, which makes for a natural fractal! Launched Aug. 12, 2005, the MRO spacecraft has been studying the surface of Mars from orbit since March 2006. 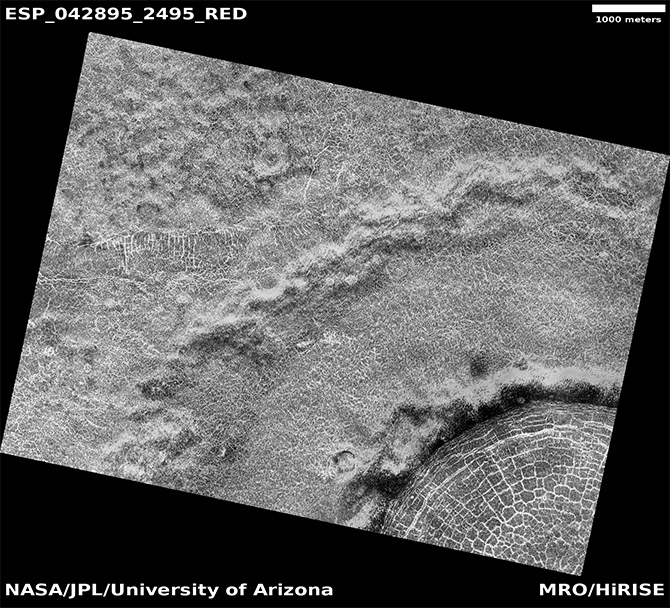 Its High-Resolution Imaging Science Experiment (HiRISE) camera, run by researchers at the University of Arizona’s Lunar and Planetary Laboratory, provides incredibly detailed images of Mars’ varied terrain in visible and near-infrared wavelengths. HiRISE is capable of resolving structures on Mars’ surface down to about a meter in size from its location in orbit. The image above was acquired from a distance of 196 miles (314 km). WOW! What a view! Thanks, DD -- That "Glory Shot" of Mars is fantastic! That is quite the shot...I put the mapper there as well for the curious, but you already know it is a "shot" to the right of the "3 sisters" and Olympus Mons. You can really see the depth of the depressions.